Bill Robinson was born on March 2, 1922, in Alfred, New York. After attending the New York State Agricultural and Technical Institute in Alfred, he enlisted in the Aviation Cadet Program of the U.S. Army Air Forces on October 13, 1942. 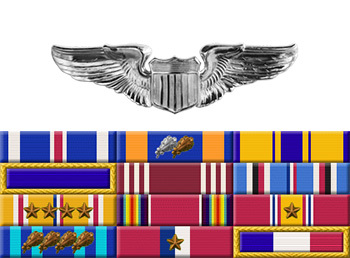 He was commissioned a 2d Lt in the U.S. Army Air Forces and awarded his pilot wings on January 7, 1944, and then completed B-24 Liberator Combat Crew Training between January and June 1944. His first assignment was as a B-24J pilot with the 865th Bomb Squadron of the 494th Bomb Group at Wendover Field, Utah; Mountain Home Army Airfield, Idaho; and then at Barking Sands Army Airfield, Hawaii, before entering combat in the Southwest Pacific area in October 1944. Lt Robinson flew 40 combat missions in B-24 bombers from Angaur Airstrip in the Palau Islands from October 1944 until he returned to the United States in May 1945. He left active duty and entered the Air Force Reserve on August 31, 1945, was recalled to active duty with the U.S. Air Force in enlisted status as a Tech Sergeant on March 15, 1950, and then was promoted back to 2d Lt on June 2, 1950. 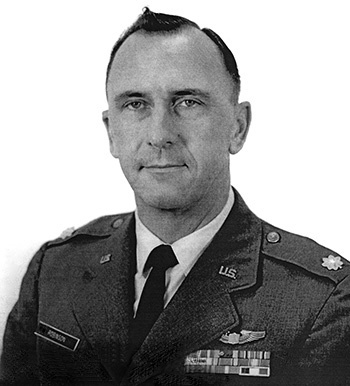 Capt Robinson served as an Electronics Officer, Design and Development Officer, Armament Officer, and Operations Officer at bases in the United States from 1950 to July 1955, and as a Quality Control Officer with the 4th Aviation Depot Wing at RAF Station Greenham Common, England, from July 1955 to July 1958. His next assignment was as a Weapons Officer, Weapons Maintenance Officer, and then as Chief of the Nuclear Ordnance Surveillance Division with the 3079th Aviation Depot Wing at Wright-Patterson AFB, Ohio, from August 1958 to March 1962, followed by service as a Nuclear Ordnance Surveillance Officer in the Munitions Division with Headquarters Air Force Logistics Command at Wright-Patterson from March 1962 to September 1963. Maj Robinson received an Air Force Institute of Technology assignment to complete studies in astronautical and space vehicles with Minneapolis-Honeywell Corporation from September 1963 to June 1964, and then served as an Aeronautical Engineer, Development Engineer, and then as Chief of the Programs Office with Headquarters Arnold Engineering Development Complex at Arnold AFS, Tennessee, from August 1964 to June 1967. His final assignment was as Commander of Antigua AS in the West Indies from June 1967 until his retirement from the Air Force on August 1, 1969. Bill Robinson Flew West on September 21, 2014. For extraordinary achievement while participating in combat aerial flight on 10 March 1945. During this mission, as a crew member of a heavy bombardment type airplane, assisted in destroying a large number of enemy ground installations and troop concentrations at Zamboanga, at the time when neutralization and destruction of these defenses was most essential to our invasion forces. This was a round trip flight of 1670 miles and 10 hours duration in extremely adverse weather, of which approximately 85% was over water. The formation was under heavy attack from enemy anti-aircraft fire, but despite this obstacle the mission was completed successfully. The cool courage in the face of great danger, the high degree of professional skill and devotion to duty displayed by Lt Robinson exemplifies the highest traditions of the Army Air Forces.